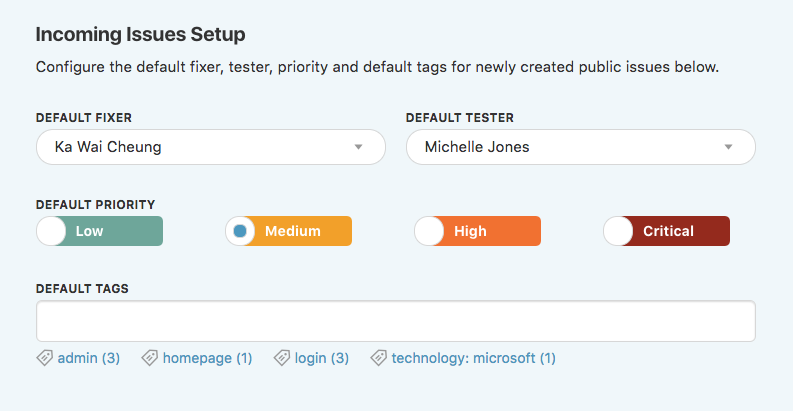 You can configure the default fixer, tester, priority level, and tags for incoming Public Issues on any given project. If you're a project or account admin, head to the project's dashboard, then click on the Project Settings icon and choose Public Issues Settings. Under the Project Settings panel, scroll to the Incoming Issues Setup section and fill in the default values you want to set for each Public Issue that comes in. Finally, scroll to the bottom of the panel and click the Save Changes button. You're all set!